Located in the spot where the Blue Dolphin & What's Cookin' were located, DSK has a grand re-opening set for this weekend. Discovery Sea Kayak has moved to the Old Blue Dolphin location at 185 First Street and will be hosting a grand reopening this Friday, Saturday and Sunday offering discounts on most store items. 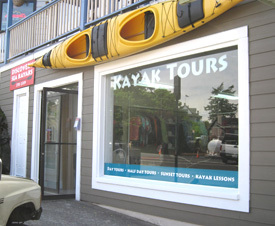 San Juan Island’s only full service kayak shop offers tours, lessons, paddle gear, kayak sales and outdoor clothing by North Face, Marmot and OR. After four years in their old location next to the ferry dock, Discovery Sea Kayak has moved closer to the core area of town yet still close to the ferry for kayakers who want to spend a day or a week on the water with Discovery’s highly trained sea kayak guides. Those guides and Discovery’s commitment to high quality, small group custom kayak tours were instrumental in Discovery’s “Best Outfitter on Earth Designation” from National Geographic Adventure Magazine in 2008 and 2009. Richard Swanson co-owner of Discovery says the move provides better access to locals and paddlers alike with better parking and general ease of access by avoiding the congestion associated with the ferry, yet they’re still within walking distance to the ferry. “Most people didn’t know that we are a full service paddle shop which also offers a wide range of gear and clothing suitable for the outdoors” said Swanson. Come by this weeekend and check out the new location and some great deals with Discovery Sea Kayak, 185 First Street in the Old Blue Dolphin Cafe.